If you are interested in how to reduce your home or business’s carbon footprint, upgrade to appliances such air energy-saving air conditioning units, or simply reduce monthly bills, green living bloggers should be your go-to resources. Because all of them offer highly actionable and practical tips from their own experience! Some of these bloggers may be energy-savings experts. Others may be stay-at-home moms or dads trying to create a healthier home for their families. The wider the range, the greater the likelihood of you finding useful things to apply yourself. Below is the list of one-of-a-kind Green Living Bloggers to Follow RIGHT NOW for tried-and-tested solutions for going green in and around your home and office, teaching your kids about composting, improving indoor air quality, going solar on a budget, saving money on energy bills, and more! Started way back in 2007, this is a blog with tradition. For more than a decade, The Environmental Blog has been providing commentary on climate change, as well as tips on using green technologies, green travel, recycling, being eco-friendly towards animals and the environment in general, and maintaining a sustainable lifestyle. One-of-a-kind because: It’s a continuously updated encyclopedia that is so easy and fun to read! Bea Johnson’s Zero Waste Home selflessly shares personal experiences with the zero-waste lifestyle and the philosophy of reusing and recycling. One-of-a-kind because: Of the Bulk Finder. Find out more on Bea’s blog! Lori Popkewitz Alper is not only a green living enthusiast – she’s also a former attorney who really knows how to make a case for non-toxic products, sustainable living and an overall greener lifestyle. One-of-a-kind because: Of Lori’s relentless advocacy for healthier living. 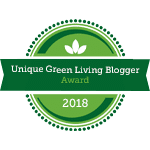 Tiffany Washko’s blog is the go-to guide not only to green moms but to everyone who believes that green living is a lifestyle and not just a concept. One-of-a-kind because: Of the amazing recipes and tips on how to use essential oils that Tiffany sends to your email! If you thought that green living is reserved for the mom blogosphere, Derek Markham is here to prove you wrong. His blog details personal experiences with alternative and sustainable living, natural foods and living green in a tiny home. One-of-a-kind because: Of the spot-on fatherhood advice by a loving dad! Greg Seaman offers down-to-earth advice on how to live a simpler yet richer lives by adopting the philosophy of self-sufficiency and green living. One-of-a-kind because: Of invaluable advice on going green in the garden by a great blogger with a green thumb! Scarlet Paolicchi teaches us how to pick out and use safe and natural products in our homes and how to cut down energy bills by going green. One-of-a-kind because: Of practical tips on green home décor! Sommer Poquette deliver advice on green living with all the skill and expertise of a marketing manager, book writer, and a role-model mom. One-of-a-kind because: Sommer started blogging when blogging wasn’t even a thing! Seth Leitman takes the green living debate up a few notches by adding priceless advice on electric and environmentally-friendly cars. One-of-a-kind because: Of the insights on Green Fashion and organic clothing! Diane MacEachern, an author and entrepreneur, is an expert on saving up while working towards a greener lifestyle. Her blog gives you practical advice on healthy purchases, and also distinguishes green from green-washed products. One-of-a-kind because: It uncovers volunteer opportunities that can actually help you save cash by going green! This tongue-in-cheek blog was founded by Hank Green and teaches us how to put our brainpower to good use and help save the planet. One-of-a-kind because: It encourages users to send practical tips that get researched and presented by a talented team of experts on the relationship between nature and technology! Calley Pate is a talented green living blogger and cloth diaper expert. On her blog, she presents the everyday joys and challenges of eco-friendly parenting. One-of-a-kind because: Of the fantastic cloth diaper giveaways! Greenne – The Eco Friendly Blog is a real gem in the green living blogosphere. It maintains the delicate balance between expert insights into eco-friendly living and down-to-earth palatable tips for eco-minded home and business owners. One-of-a-kind because: Of standout ideas for eco gifts to present to loved ones whom you would like to inspire to go green! Robert Rodriguez Jr is a landscape photographer devoted to helping people get closer to nature. His blog details the photographic journey through creativity, digital art and natural wonders. One-of-a-kind because: Every post is a colorful visual reminder of how beautiful the world around us is! Jennifer has built Eco-Office Gals into an indispensable resource of environmentally-friendly safe-to-use products to help business become green and paperless. One-of-a-kind because: It teaches you how personal and professional growth are affected by going green! Eliza Cross’s brilliant blog shows us that going green is easier than we think when we have clear goals and objectives. One-of-a-kind because: Of the January Money Diet initiative! You simply have to check it out! Jetson Green’s blog covers popular topics such as prefab and single family homes, passive and tiny houses, solar technology and LEED Platinum projects, and more. One-of-a-kind because: Regardless of whether you are a home owner, renter, designer, builder, entrepreneur, or developer, you can find practical information on Jetson Green’s blog every week! Heather Hawkins and Renee Limon are Master Recyclers who share witty insights into the challenges of raising eco-minded children, and other practical tips on how to leave a smaller ecological footprint. One-of-a-kind because: Of the One Can Challenge! Check it out to see how you can reduce trash in your home to only one can a month! Dawn is a green living blogger who represents the belief that sustainability starts at home. Her blog teaches us out of our consumerist habits and into a healthy life of green frugality. One-of-a-kind because: Of the Make a Difference section that instructs you how every step you take towards a greener lifestyle matters! Dan, the blogger behind the EnviroGadget, is a voiced advocate of green technology, and provides insightful reviews of the latest eco-friendly inventions and gadgets. One-of-a-kind because: Of the largest resource of gadget reviews, from automotive eco gadgets to DIY green gadgets! Megan McWilliams Bouchard is the founder of The Green Divas, a platform for high-profile green warriors to share their stories and advice on living a greener and richer life. One-of-a-kind because: Of The Green Divas Radio Show! You don’t want to miss a single one! Zoë Morrison reminds us over and over again how each step we make towards living an eco-minded life is a step towards guaranteed financial stability. One-of-a-kind because: Of the #NoWasteWithin pledge! Carissa Bonham’s blog is a beautiful selection of healthy recipes, DIY crafts, green gardening tips, and an invaluable resource of eco-minded parenting tips, ranging from kids crafts to vaccines. One-of-a-kind because: Of Carissa’s visual cooking tutorials! Steve claims that one of the easiest ways to neutralize our impact on the environment is to offset our carbon use. His blog details how he manages to reduce his waste and carbon footprint. One-of-a-kind because: Steve explains how he calculates his carbon footprint! No list of green living or energy saving blogger will ever be complete without Martin Holladay’s blog on Green Building Advisor. One-of-a-kind because: He built his first passive solar house in northern Vermont in 1974, and has lived off the grid since 1975! Killer post: All of them, it’s impossible to single out just one! and PromotionsWe have amazing discounts and promotions.